It’s been 10 years since Kvothe, the notorious protagonist of The Name of the Wind, entered our lives. Patrick Rothfuss’ debut novel introduced us to Kvothe’s stunning world with the first book in The Kingkiller Chronicle series, and millions of readers have lost themselves in the pages since then. The physical book itself is glorious. It’s a black hardback (with the word “VALARITAS” pressed into the front cover) sporting red-edged pages reminiscent of Kvothe’s striking hair. My name is Kvothe. I have stolen princesses back from sleeping barrow kings. I burned down the town of Trebon. I have spent the night with Felurian and left with both my sanity and my life. I was expelled from the University at a younger age than most people are allowed in. I tread paths by moonlight that others fear to speak of during day. I have talked to gods, loved women, and written songs that make the minstrels weep. You may have heard of me. The pronunciation guide opens with a lovely note from Rothfuss, explaining that readers shouldn’t feel the need to change the way they’ve been pronouncing names and places from the book. He writes, “This list is so…people can satisfy their curiosity…and maybe settle the occasional bar bet.” That said, we’d bet that nine out of 10 readers have been mispronouncing Abenthy’s name for a decade. As if you needed more proof that Rothfuss is a master world-builder, the new edition boasts an appendix explaining the Aturan calendar. So for those of you who wondered how many months are in the year (eight) or how many span are in a month (four) or how many days are in a span (eleven), now you can find answers to your questions. Just don’t get us started on the “chaos” surrounding the Seven Days of High Mourning. Just look at the tiny tinker in the compass rose! “No one writes about economic reality within this genre like Pat Rothfuss. The real-world weight of the sometimes impossible distance between the things you want and need and what you have in your pocket. No one writes about music like Pat Rothfuss. The way it sneaks into your soul, the way it feeds you like nothing else. No one writes about stories like pat Rothfuss. How the right story at the right time can change the world, how the teller can shape a life. Holy. Cow. Rothfuss goes into ridiculous—yet wonderful—detail about four currencies: Cealdish, Commonwealth, Vintish and Aturan. This is a goldmine (we’re not sorry) of information spanning 11 pages, including illustrations and a currency exchange receipt by Nate Taylor. 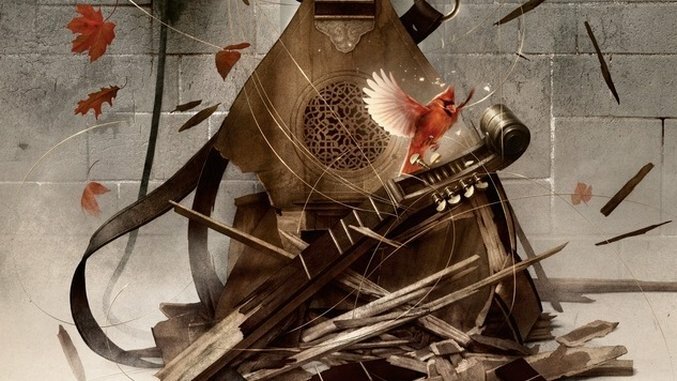 In a letter titled “How I Came to Publish The Name of the Wind,” DAW Books President, Co-Publisher and Co-Editor in Chief Betsy Wollheim describes how she became Rothfuss’ editor. It’s a delightful behind-the-scenes look from one of the key players who brought The Name of the Wind into our lives (and who talked Rothfuss out of the cheesy title: Kvothe the Bloodless). Similar to the writing in his blog, Rothfuss’ author’s note offers an honest, meandering, entertaining peek into the writer’s mind. From 5th grade Rothfuss’ desire to join a D&D group to current Rothfuss’ charity work and love of beekeeping, the note’s topics offer snapshots of Rothfuss’ life—and reveal his journey as a published author. It’s classic Rothfuss, and that makes it wonderful. The Name of the Wind 10th Anniversary Deluxe Edition is available now from DAW.